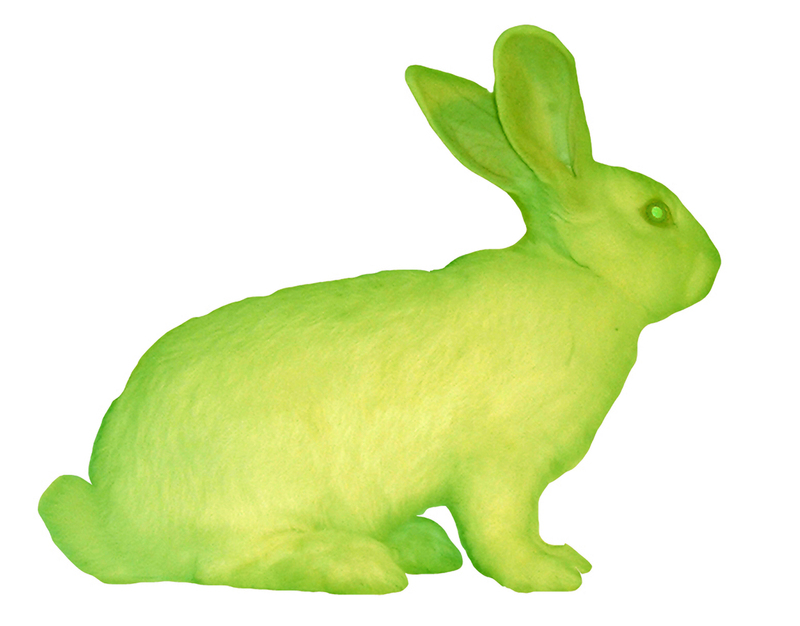 Genes from a jellyfish were inserted into a rabbit to make an iconic trangenic artwork in the year 2000. Photograph by Eduardo Kac. Hobbyists who tinker with gene editing tools usually have scarce resources and limited capacity to create potentially harmful organisms, when compared with university, government, and corporate laboratories. As of August 2015, four biotech startup companies focusing on health applications of the technology have raised at least $158-million in venture capital. Vertex Pharmaceuticals made a “$2.6-billion bet” on one of these startups, CRISPR Therapeutics, last November. [ii] While many companies promise to revolutionize human health care, other biotech start-ups are focusing on using CRISPR in agriculture and for industrial production by microbes. The United States invested approximately $820 million dollars in synthetic biology research from 2008-2014, but less than 1 percent of these federal funds went to risk research. [iii] While individual research projects at established institutions routinely undergo internal risk assessments, the federal government has invested little to monitor the biocontainment of synthetic organisms. As the scale and the speed of genetic engineering increases dramatically, bioartists are using molecular tools to explore hazards to public health and ecological communities. Free Range Grain provoked discussion about the difficulties of regulating biotechnology in a global legal landscape. [vi] “You can ban GMOs,” said Steve Kurtz, a co-founder of Critical Art Ensemble, “but that doesn’t mean that they aren’t coming.” With this project Kurtz aimed to catalyze public debate about scientific evidence of the harms and benefits of genetic engineering. The widespread use of transgenic crops in agriculture has been driven by a variety of potential benefits, including increased yields, easier and more effective weed/pest control, lower prices to consumers, a wider variety of produce available throughout the year, and the production of nutrient-enriched staples. [vii] But there are also scientific findings about problems created by genetically modified organisms already on the market and in the wild. 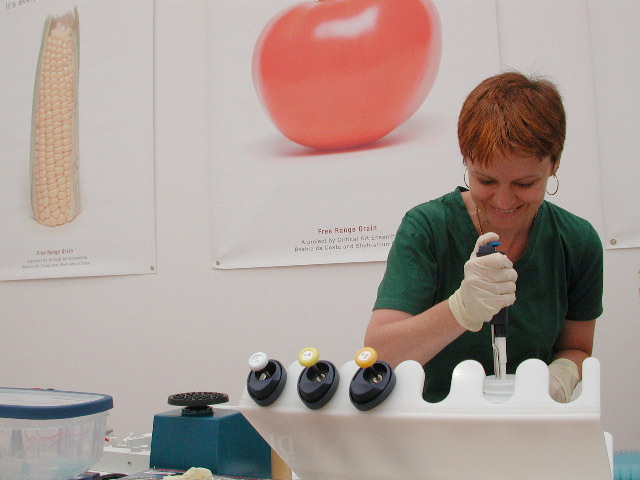 Artists used the tools of molecular biology to search for genetically modified foods in Europe. Photograph courtesy of Critical Art Ensemble and Beatriz da Costa. The Biofortified Blog, a website supported by the biotechnology industry, created Frank N. Foode™ as their official mascot. This “friendly neighborhood genetically modified organism” has been photographed with famous people like Secretary of Agriculture Tom Vilsack, and food writer Michael Pollan. Photograph from Biofortified Blog’s Flickr Stream. 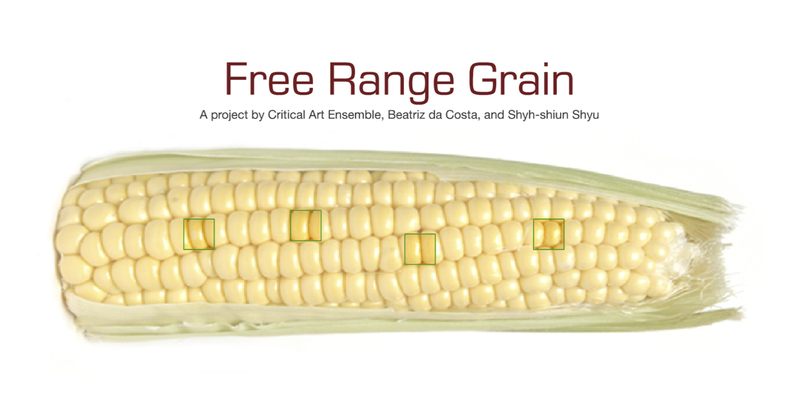 The Critical Art Ensemble wanted to bring their Free Range Grain exhibit to the United States to test unlabeled foods for GMOs. But the artist collective was shut down in a dramatic action by Homeland Security and the Joint Terrorism Task Force in 2004. FBI agents raided the home of Steve Kurtz in Buffalo, New York—seizing his laboratory equipment, including a PCR machine he had been using to test for genetically modified sequences. Kurtz’s wife had unexpectedly died in her sleep on May 11th, 2004. While the Erie County Medical Examiner’s Office ruled that she died of natural causes, paramedics had become suspicious when they found petri dishes with live E. coli bacterial cultures and scientific equipment in the couple’s home. [xviii] Initially Kurtz was detained on suspicion of “bioterrorism,” but after a costly and prolonged courtroom battle he was cleared of all charges. 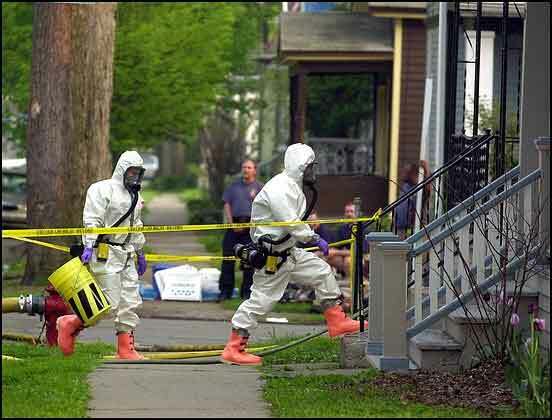 An FBI hazardous materials team raided the Critical Art Ensemble co-founder Steve Kurtz’s house in Buffalo, New York, where they found harmless strains of bacteria. Photograph by Don Heupel – AP. While the Critical Art Ensemble was using a harmless strain of E. coli for an art project, someone with malicious intent could theoretically manufacture harmful bacteria relatively cheaply. E. coli are part of the normal human gut flora and are readily available to artists or hackers through biological supply companies. Some strains of E. coli are virulent—producing diarrhea, fever, bloody stool, and, in rare cases, death. Someone with a DIY CRISPR kit could technically make custom DNA sequences from known pathogens and insert the genes into their organism of choice. Safeguards are in place to prevent citizen scientists from inadvertently working on pathogens, according to Emily Leproust, the CEO of Twist Bioscience—a company based in San Francisco that offers gene synthesis to commercial customers. Synthetic biology companies generally use a two pronged screening processes: customers are vetted and gene sequences are checked against a database of harmful organisms. All customers who order DNA sequences from Twist Bioscience are checked against government lists of unauthorized individuals and entities, including the Specially Designated Nationals (SDN), the Debarred Denied Persons, Entity, and Unverified lists, as well as the German government Handbuch der Deutschen Exportkontrolle. 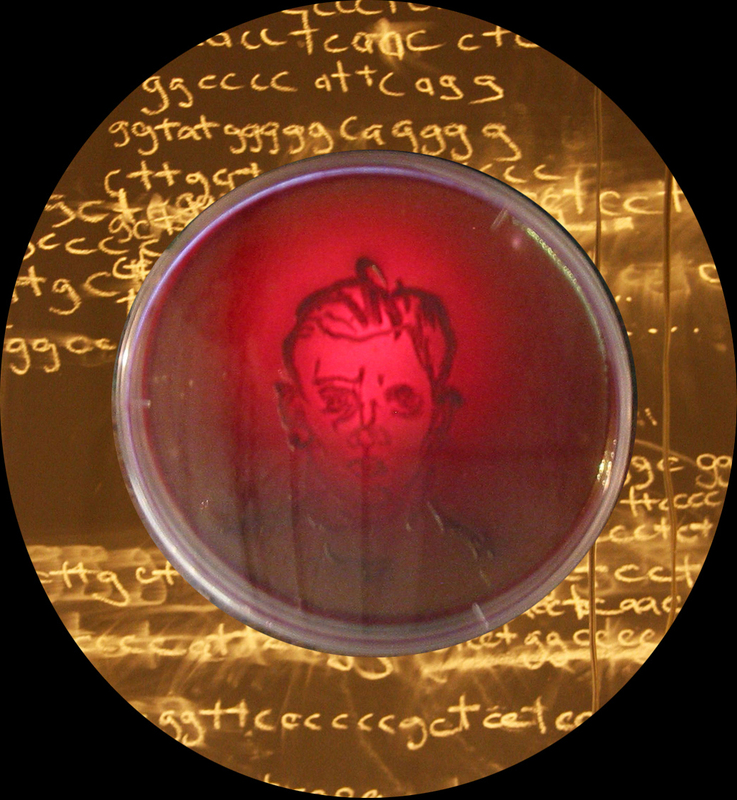 Human DNA was inserted into living E. coli bacteria to create experimental media for painting “Alzheimer’s Portraits.” Like the memory and personality of people with Alzheimer’s Disease, these living paintings faded as they aged. Artwork by Andre Brodyk. Currently there is not a formal mechanism that allows independent environmental scientists to submit organisms of concern for possible inclusion in the IGSC Database. Some known pathogens, like the chytrid fungus that is responsible for the extinction of amphibians (Batrachochytrium dendrobatidis), might not be priorities for government regulators since they are not driving economic losses. Twist Bioscience is ready to help set industry standards, says Leproust, by accepting submissions directly from the scientific community—going on and beyond the IGSC standards, to add organisms of possible concern to their internal database. 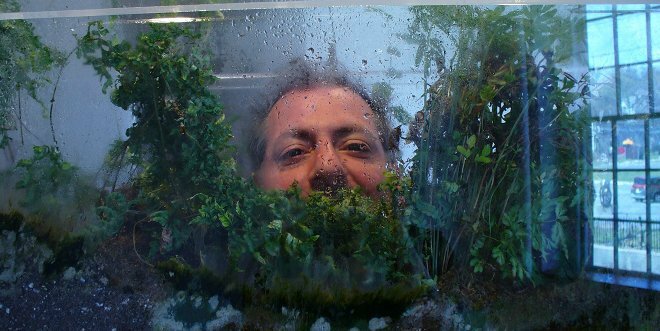 Adam Zaretsky has deliberately released mutant animals into the wild, bringing attention to the novel forms of life that are routinely escaping from laboratories. He has also created new forms of laboratory life. 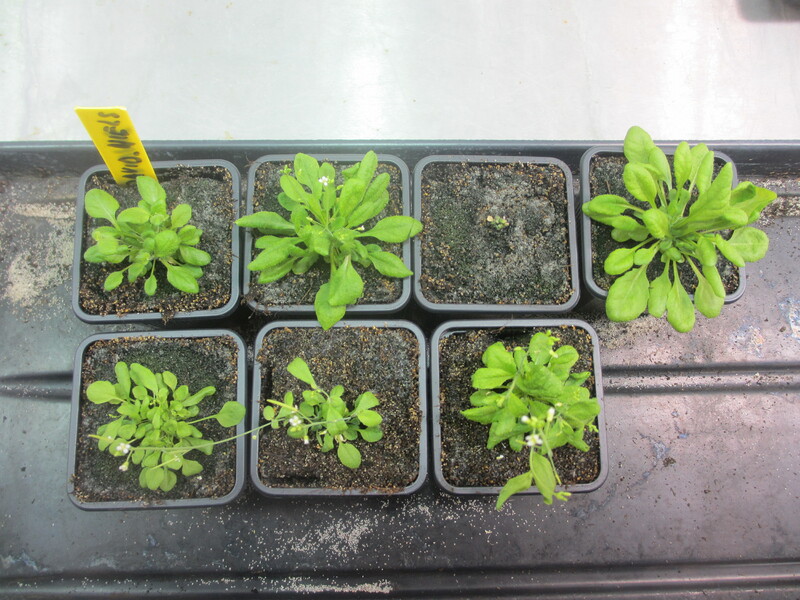 Using the tools of molecular biology Zaretsky altered the growth patters of mustard plants (below). Radically different growth patterns emerged. Photographs courtesy of Adam Zaretsky and David Louwrier. 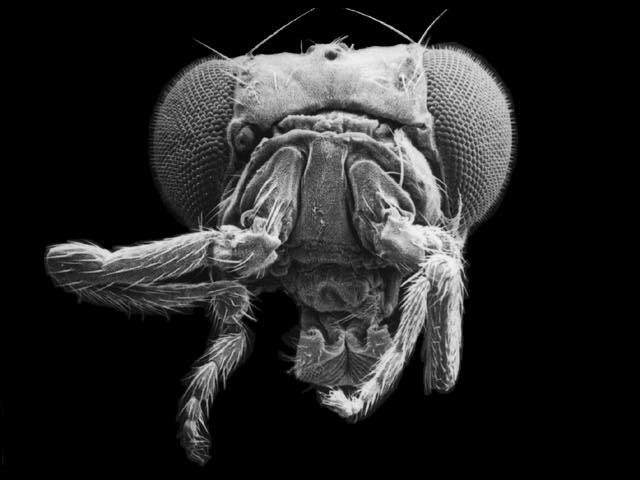 Many transgenic organisms, like these antennapedia fruit flies with legs growing out of their heads, are seriously debilitated and unlikely to survive in the wild. Other creatures that have been modified by humans have traits that give them an advantage over organisms with the original genetic condition. Electron microscopy by Rudi Turner. Drought-tolerant corn and other crops resistant to blights are being created by DuPont Pioneer in collaboration with Caribou Biosciences, a company co-founded by CRISPR pioneer Jennifer Doudna. Caribou has already raised $11 million in initial funding to use gene editing tools for medical therapy, industrial chemical and enzyme production by microbes, as well as agriculture. Corn and wheat plants edited with CRISPR are already growing in greenhouses and will be planted in field trials this spring. [xxiii] “Precision breeding technologies have the benefit of being able to introduce naturally occurring, valuable traits much faster and more precisely than using traditional breeding methods,” said Andrew May, Caribou’s Chief Scientific Officer. In contrast to the regulations that govern the sale of earlier genetically modified organisms, like Bt corn, the US government might decide to not regulate products made with CRISPR before they go to the market. Nations without strong biotechnology industries—like East Timor, Ethiopia, and Bolivia—were pushing for an even stronger UN declaration. These countries called for a complete moratorium on the release of synthetic organisms, saying that new products could replace agricultural commodities and devastate their economies. [xxvii] CRISPR has the potential to exacerbate inequality along lines of race, class, and gender, according to Charis Thompson. Underserved groups in powerful countries, and whole nations that are structurally marginalized in the global economy, might not enjoy the benefits of CRISPR even as they are exposed to environmental and health risks. “It is important to encourage bioart and biohacking beyond the ‘garage’ which tends to be associated with the same white masculine competitive start-up ethos as the dominant tech industry,” Thompson said. 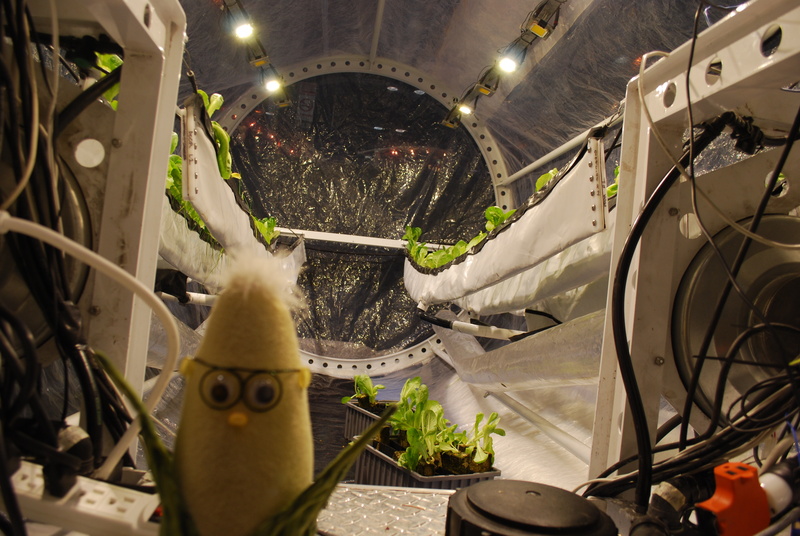 Since it is relatively difficult to engineer organisms that can actually thrive in the wild, biosecurity risks are less likely to emerge from low-budget hackers but instead from large-scale commercial ventures. Even if databases can help protect public health and the environment from known pathogens, it is difficult to safeguard against the unknown as transgenic organisms accidentally escape from laboratories. Genetically modified plants are already hybridizing with wild relatives with unpredictable results. 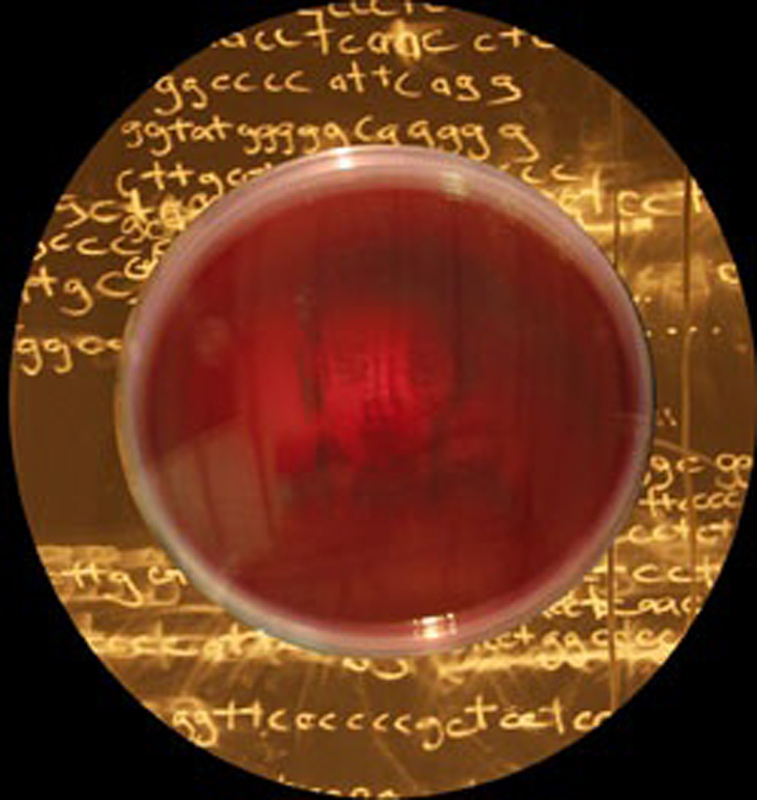 As thousands of foreign genes are inserted into E. coli bacteria with CRISPR these novel “biohacked” strains have the potential to accidentally escape into the wilds of the human microbiome. Unified international laws will likely not be developed for synthetic biology, if climate change negotiations are to serve as a guide. But, instead we will hopefully see thousands of small precautionary decisions by regulators, university ethics committees, bench scientists, and communities of hackers. Centaurs are not running wild yet, and actions are being taken so that citizens are not left to chase after escaped Frankenstein monsters with torches. Artists and citizen scientists are helping create an arena for the public to face an emergent transgenic reality. Rather than fear bioartists with CRISPR kits, the scientific community is starting to appreciate their critical contributions to our shared cultural archive. Eben Kirksey has published two books with Duke University Press—Freedom in Entangled Worlds (2012) and Emergent Ecologies (2015)—as well as one edited collection: The Multispecies Salon (2014). Eben studies the political dimensions of imagination as well as the interplay of natural and cultural history. Writing in collaboration with Stefan Helmreich he coined the term “multispecies ethnography” to describe new approaches for studying contact zones where the lines separating nature and culture have broken down. Eben Kirksey holds a three-year DECRA fellowship from the Australian Research Council which is enabling his work in Europe, the Americas, and the Pacific (2014-2017). He is a permanent faculty member in the Environmental Humanities program at UNSW. Currently he is Princeton University’s 2015-2016 Currie C. and Thomas A. Barron Visiting Professor, where he is researching and writing a new book. [i] Baker, S. Tate Magazine, 26, 42-7 (September 2001). [v] Kelley, L. BioArt Kitchen (I.B. Tauris, 2016), 101. [vii] Chapman, M. A. & Burke, J. M. New Phytol, 170, 430 (2006). [ix] Chapman, M. A. & Burke, J. M. New Phytol, 170, 436-7 (2006); Schafer, M. G. et al. PLoS One, 6, e25763 (2011). [x] Londo, J. P., Bautista, N. S., Sagers, C. L., Lee E. H., Watrud, L. S., Ann Bot, 106, 957-65. [xi] Landrigan, P. J. & Benbrook, C. N Engl J Med, 373, 693-695 (2015). [xii] Losey, J. E., Rayor, L. S., Carter, M. E. Nature, 399, 214 (1999). [xiii] Hodgson, J. Nat. Biotechnol. 17, 627 (1999). [xiv] Murphy, J., Levidow, L. & Carr, S. Social Studies of Science, 36, 133-160 (2006). [xv] Sears, M. K. et al. PNAS 98, 11937-11942 (2001). [xvi] Meissle, M., Zund, J, Waldburger, M., & Romeis, J. Scientific Reports, 4, 5900 (2014). [xvii] Dirzo, R. et al. Science, 345, 401-406. [xxi] Chapman, M. A. & Burke, J. M. New Phytol, 170, 437. [xxii] Kimura, M. Nature 217, 624-6. [xxv] Charo, A. & Greely, H. The American Journal of Bioethics 15, 13 (2015). Kirksey E. Who is Afraid of CRISPR Art?. Somatosphere. 2016. Available at: http://somatosphere.net/2016/who-is-afraid-of-crispr-art.html/. Accessed April 22, 2019. Kirksey, Eben. 2016. Who is Afraid of CRISPR Art?. Somatosphere. http://somatosphere.net/2016/who-is-afraid-of-crispr-art.html/ (accessed April 22, 2019).